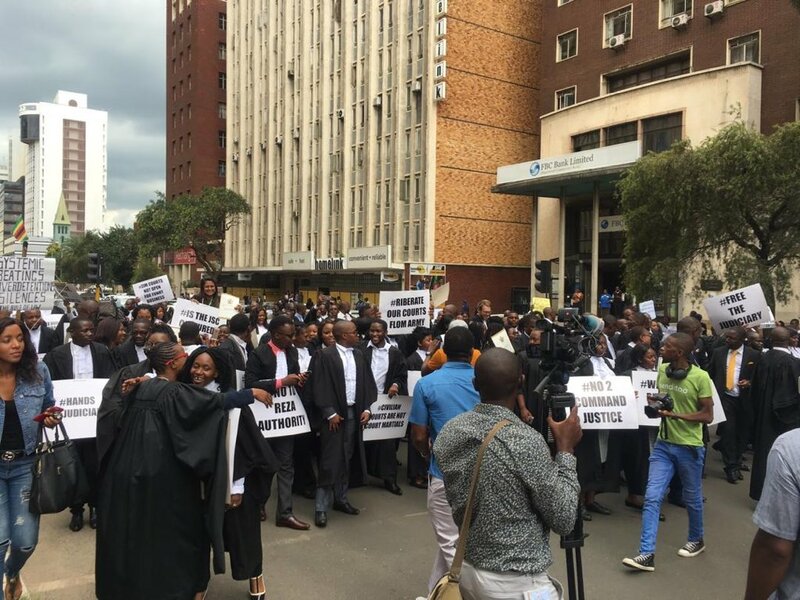 The fallout in the legal fraternity continues as a handful of lawyers embarked on a march dubbed #MarchForJustice yesterday, confirming revelations by The Herald on Monday that shadowy forces had roped in some Harare-based lawyers to demonstrate against the Judiciary. Part of the plot to undermine the Judiciary also involves frustrating due processes through vexatious appeals. The actions are in solidarity with anti-Government protests spearheaded by the opposition MDC-Alliance, leading to wanton violence and destruction of property. Led by Ms Beatrice Mtetwa, known for her anti-Government stance, the lawyers, who were waving placards some of which were inscribed “No 2 Command Justice”, “Fast-Tracked Justice”, “Justice Hurried is Justice Denied”, marched from Zambia House to the Constitutional Court in Harare. On arrival at the apex court Ms Mtetwa and her team handed over a petition for the attention of Chief Justice Luke Malaba. Acting Judicial Service Commission secretary Mr Walter Chikwana received the petition on behalf of the Chief Justice. The protestors were mainly members of pro-opposition Zimbabwe Lawyers for Human Rights, which has been identified as one of the non-governmental organisations behind recent protests by the MDC-Alliance and its civil society partners meant to subvert the constitutional order. Herald sources revealed that there were attempts to capture the Law Society of Zimbabwe to endorse the anti-government stance by a section of lawyers led by Mr Douglas Coltart and Ms Mtetwa. This set the stage for a fiery meeting on Monday evening that The Herald understands led to a schism in the fraternity with some senior lawyers clashing with anti-government lawyers during the LSZ’s extraordinary general meeting to discuss the state of the rule of law in the country. Veteran lawyers accused ZLHR-led by Ms Mtetwa of hijacking the meeting to push for an unwarranted demonstration against the judiciary resulting in the meeting ending prematurely, without resolutions. The Herald understands Ms Mtetwa and her camp irked some members of the society after trying to loop them in their bid to soil the reputation of the judiciary. According to the sources, Ms Mtetwa, Doug Coltart and another lawyer, one Emma Drury, wanted to capture the LSZ and force a vote in favour of yesterday’s march. “It became clear very early in the meeting that Beatrice Mtetwa and Douglas Coltart, the Zimbabwe Lawyers for Human Rights had arranged to use the meeting to rubberstamp a decision they had already made,” said one of the sources. Drury, said the source, made the remarks while responding to the LSZ president who had told the members that the meeting was for consulting members and had nothing to do with the protest march. Contributing to the discussion, Ms Mtetwa is said to have asked members to share their experiences in court while defending their clients. This irked some senior lawyers who felt the meeting was being diverted from its agenda and sought an explanation from the society’s president. “At that juncture, other senior members asked the president to close the meeting prematurely after realisation that these people had pre-arranged so that they come in large numbers and force a vote to march tomorrow,” said the source.